Grammy-winning rapper Lil Wayne's skate park project in the city's rebuilding Lower 9th Ward is off to a bumpy start. The building that houses the park didn't pass a city electrical inspection and had to be re-wired, and only a handful of children are able to skate at a time because of a shortage of staffing. Many days, the Trukstop skate park — named after the rapper's skateboarding-inspired Trukfit clothing line — hasn't been open at all. "We really put the cart before the horse on this project, and right now we're at a crossroads," said Ward "Mack" McLendon, who manages the facility. But, he said, "Everybody wants to make this work." McLendon says Lil Wayne dropped by the facility and skated with some kids while in town Super Bowl weekend. "He's on board, and he really wants this for the community," McLendon said. The 30-year-old rapper, whose publicists did not return phone calls or emails for comment, announced the park's launch last September, along with corporate partners Mountain Dew and Glu Agency, a New York-based advertising firm . At the time, the park was supposed to be open to the public seven days a week beginning Oct. 1, 2012, but opening was delayed because the facility didn't have enough staffing or insurance coverage. McLendon said the insurance issue has been resolved, so the park is open. Staffing continues to be a problem. The park is only open when there is adequate supervision, and organizers are relying on volunteers. Miatta David, spokeswoman for Glu Agency, said the sponsors are working to help establish permanent staffing. "Everyone involved in this project is committed to ensuring the park is available to our community members year round," she said. "As such, we will soon be shifting from a volunteer to a full-time based staff." The park is in the Lower 9th Ward, which was all but wiped out by floodwater from Hurricane Katrina in August 2005. While much of the city has rebounded, the Lower 9th Ward has been slower to recover. Homes were pushed off their foundations, and many residents haven't returned. Blocks where homes once stood are empty and overgrown with weeds. 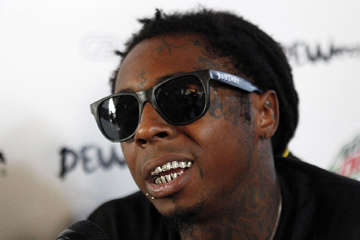 Lil Wayne, 30, whose given name is Dwayne Michael Carter, Jr., has a new album, "I Am Not A Human Being II," due out next month. He is a New Orleans native.